We are pleased to welcome you to the Georgia Institute of Technology Capital Planning and Space Management website. The Office of Capital Planning and Space Management (CPSM) supports the academic, research and administrative mission of the Georgia Institute of Technology. We advance the goals and programs of the Institute's colleges, schools, research centers and departments through the development of solutions designed to maximize Georgia Tech's facilities, infrastructure, property and physical assets. Within this site you will find up to date information pertaining to the campus master plan, landscape master plan, campus development planning, sustainability and historic preservation. Current information pertaining to the space management activities on the Georgia Tech campus including facilities database administration and event scheduling is also available. Thank you for visiting CPSM. We hope you find our site useful, informative and easier to navigate. Please feel free to contact us with any questions or comments regarding our site. Defining the framework for effective utilization and adaptation of Georgia Tech’s campus environments to support our motto of “Progress and Service” through academic innovation, research advancement, and entrepreneurship. 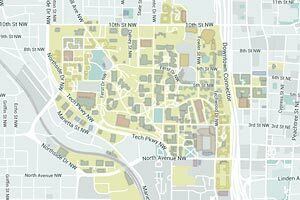 We provide a variety of services for the planning and space management needs of the Georgia Tech community.